excess fuel consumption attributable to such congestion. (The total cost of traffic congestion is much higher and also includes the cost of higher accident rates, congestion-related stress, missed meetings, lost productivity, shipping delays and related business inefficiencies.) At this rate, and assuming stable gasoline prices, congestion costs will grow to $240 billion by 2020, an average of $1,700 per highway commuter per year. It is not your imagination: traffic congestion is bad and getting worse in almost all major metropolitan areas. From the 1950’s into the 80’s, pockets of congestion would appear but relief would follow within a few years in the form of highway expansion. 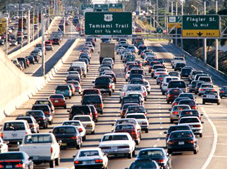 Beginning in the 1980’s highway expansion began to decline, resulting in a relentless increase in congested traffic. This trend is likely to get worse. Designing an optimal solution requires a clear understanding of the role private vehicle travel plays in our economy. Wealth and Mobility : Learn how congestion is the by-product of too much of a good thing, the private automobile. Drowning in our Success : The trend in worsening congestion is well-established and documented. Need for an Auto-Centric Solution: We drive because our time is valuable. Regional Traffic Issues : Examine congestion issues in the context of specific regions. Transit : Public transit is not a solution to traffic gridlock.